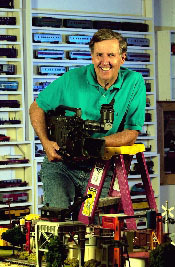 Tom McComas became involved with toy trains by accident and with reluctance. It was 1970. McComas ran his own film production company in Chicago. He produced documentaries and commercials. He also produced a promotional film for a friend who had invented a new toy. The new business venture failed. "He wanted to leave town," recalls McComas, "but he felt bad about the $5000 he owed me, so he offered me three boxes of old trains. I had absolutely no interest in the trains, but he insisted so I took the trains and stuck them in my apartment’s storage area in the basement." A year later, McComas had some guests over for dinner. One guest was a train collector. McComas told him about the trains. After dinner, McComas and his guest went down to the dusty basement. McComas spread the trains out on the floor. The guest offered $7500. It was at that precise moment McComas became interested in toy trains. Turns out there were about 7,000 train collectors in the country. Very little had been written about toy trains and information was passed primarily by word-of-mouth. McComas, after meeting a number of new collectors who, like himself, were having a hard time researching Lionel trains, decided there was a market for a book. "I would have bought the book if it were available," says McComas. So much for focus groups. Tom contacted Jim Tuohy, a good friend and one of the best writers in Chicago. "What do you know about toy trains?" asked Tom. "Neither do I. Let's write a book." Incredibly, they convinced a bank to loan them $20,000. It was the summer of 1974. McComas and Tuohy started a basic reporting job, interviewing knowledgeable collectors from all around the country. McComas made a mailing announcing the book. He also took it to a national train show in Seattle. "I stacked the books on a table and it was like selling cold beer in Brooklyn on a hot summer night. Guys were grabbing the books and throwing money at me. I think I sold 300 books in less than two hours. It was amazing." All 10,000 books sold in less than six months. McComas paid the bank back and found himself in the publishing business. Over the next five years, McComas and Tuohy wrote six hardcover books on the history of Lionel and how to collect Lionel trains. Since the McComas-Tuohy books, many more have been written on collecting trains, but those first TM books, reprinted three times, are still considered the definitive work on Lionel. The books helped fuel the rapid growth of the train-collecting hobby. In the 80s and 90s, those kids from the 50s were reaching their peak-earning years and could now afford to buy all those trains they wished for as kids. The hobby grew to over 100,000 and the six-volume McComas-Tuohy set was a “must read” for collectors. McComas and Tuohy next collaborated on Great Toy Train Layouts of America. Published in 1987, this hardcover book featured color pictures and stories about elaborate layouts around the country, including Frank Sinatra's. Sinatra was a toy train enthusiast and had been a TM customer for years. In the late eighties, the emergence of special interest video prompted McComas to return to his filmmaking roots. The Great Layout book eventually became a six-part video series. Part 1 was chosen by People Magazine as one of the ten best videos of 1989. This was the first of many awards TM would win. So McComas put together a show featuring the things Jeff liked – trains, animals, jokes and snappy music. The show was a big hit with Jeffrey. McComas' wife, Charyl, thought other kids might like it too, so they designed a cover, called the video I Love Toy Trains, and took it to a video trade show in Las Vegas. "It was the hit of the show," recalls Charyl. "We received orders from Blockbuster, Readers Digest, Costco. It was amazing." I Love Toy Trains quickly became TM’s best-selling title and one of the best-selling children's videos in the country. The series began to win awards and gain national exposure in magazines and on TV. “We started work on part 2 immediately,” says Charyl. Tom appeared on the Tom Snyder Late Late Show in 1999. Snyder was an enthusiastic train collector and, through the years, had purchased TM books and videos. The show aired in early December and was so popular CNBC decided to rerun it four times over the Christmas holidays (while Snyder was on vacation). “They would show our 800-number and our phone lines would go crazy,” says McComas. TM was told in advance each time CNBC ran the show except once. “It was New Year’s Eve, and we had some friends over for dinner,” recalls McComas. “Around 11, Charyl asked me to get something from the office so I went out, and while I was there, all ten lines lit up. They forgot to tell us they were running the show on New Year’s Eve. So I busied out the lines and ran to the house and told everyone to grab their drinks and come out.” Their guests spent the next three hours taking orders. “We invited everyone back the next year, but nobody wanted to come,” says Charyl. Each new I Love Toy Trains video received rave reviews in People Magazine, USA Today and in hobby and library journals. I Love videos were picked up by catalogs, toy stores, video stores and libraries all over the country. Sales were also being fueled by enthusiastic word-of-mouth and the one-million-unit sales mark was passed in late 2001. In late 1995, Joseph Stachler joined the video production team. Joe was a recent graduate of Columbia Film School and turned out to be a very talented cameraman, editor and writer. "Joe is passionate about filmmaking," says McComas. "Our productions have improved immensely since he came on board." Joe also is an avid collector of Lionel trains. 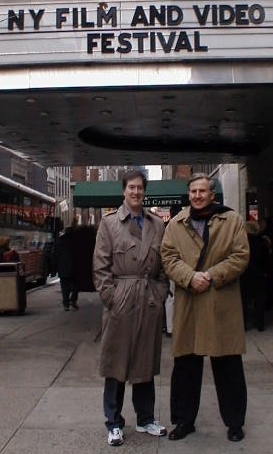 Producers Joe Stachler (left) and Tom McComas at the Sutton One Theater in Manhattan, just before the screening of their documentary on Lionel's 100th Anniversary. In 2000, the McComas/Stachler team produced a two-hour show celebrating Lionel's 100th Anniversary. The show is narrated by broadcasting legend Tom Snyder and has been shown on PBS stations all over the country. It was also chosen by the New York Film and Video Festival for competition in their documentary category. In 2002, TM released their Celebrity Series featuring the layouts of Frank Sinatra, Tom Snyder, and Mandy Patinkin. In the summer of 2003, TM spent two weeks in Wyoming filming the All About Cowboys series. PBS picked up both shows. TM connected with John Deere in 2005 and is currently working on the eleventh show about John Deere farm and construction equipment. TM has also launched a new video magazine, Lionel Nation. Each hour-long show covers all things Lionel – interviews, layouts, collections, and stories. The first three shows have received rave reviews. John Deere, Caterpillar, Boeing, Lionel, and Chicago’s Museum of Science & Industry. Not bad for a three-barn production company in Indiana.